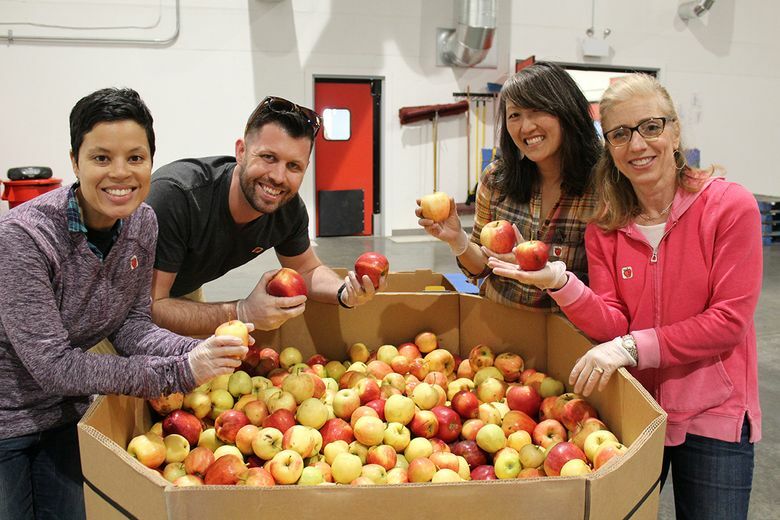 A volunteer team helps sort and repack a shipment of surplus apples from Wenatchee. It takes more than 13,000 volunteers every year to help Food Lifeline deliver 40 million pounds of nutritious food to our hungry neighbors. Last year, Food Lifeline created the equivalent of 35 million meals for hungry neighbors across 17 Western Washington counties. If you look past the dozens of construction cranes that dot the Seattle skyline, you’ll discover that our current economic boom is leaving thousands of families behind. Even though Seattle’s among the fastest-growing cities in the country, one in five children here doesn’t always have enough to eat. To make matters worse, hunger is mostly invisible. The majority of families visiting food banks actually have homes. Seventy percent of them have a member of the household that works. Nearly half of those receiving food are children and seniors. Not numbers one might expect. Last year, Food Lifeline created the equivalent of 35 million meals for hungry neighbors across 17 Western Washington counties. A large portion of this food is dairy and fresh fruits and vegetables, much of which comes from local sources. Food Lifeline now supplies nutritious food to more than 300 food banks, shelters and meal programs in Western Washington. If there’s a food bank near you, chances are Food Lifeline is helping to stock the shelves. Food Lifeline relies primarily on public support and a crew of more than 13,000 volunteers that help sort and repack the more than 40 million pounds of surplus food it rescues every year. Food Lifeline rescues millions of pounds of surplus food from farmers, manufacturers, grocery stores and restaurants, then deliver this healthy and nutritious food to more than 300 food banks, shelters and meal programs across Western Washington.